When situations feel impossible, it’s easy to panic isn’t it? The Psalmist Asaph reflected on a time when the Israelites were fleeing from Egypt (Psalm 77). Pharaoh and his armies were approaching from behind, and the Red Sea lay before them. Nothing stirs up terror quite like feeling trapped. It’s no wonder they panicked! Yet Moses instructed, “Don’t be afraid. Just stand still and watch the Lord rescue you today… just stay calm” (Exodus 14: 13-14). From a human perspective, the situation at the Red Sea was impossible. 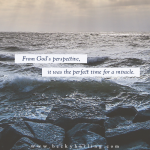 From God’s perspective, it was the perfect time for a miracle. As the Psalmist sang, God provided “a pathway no one knew was there!” (verse 19). I’ve always wondered how I would have responded if I had been there facing the Red Sea. When I feel trapped, my instincts are to run, hide, duck, or defend. Staying calm seems counterintuitive! I wonder, what’s the impossible situation you are facing at this moment in your life? Health issues, financial pressures, relational conflicts, foreboding deadlines, or career challenges? Fear may be pummeling your heart. From a human perspective, the situation may look dismal. But to God, the situation never looks dismal. Bow down in prayer. Your instincts tell you to strategize or plot. Strategies are great, but not when you need a miracle. Only God can provide a miracle. Rather than trusting human solutions, get on your knees and humble yourself before God. Admit that there is nothing you can do in your human strength—God is your only hope. Praise God that He has a plan.He knows the path that no one else can see, and He will work on your behalf. Remember King Jehoshaphat? When he was surrounded on every side by enemies, the situation for Judah looked hopeless. Jehoshaphat cried out, “Lord we don’t know what to do, but our eyes on are you!” (2 Chronicles 20:12). Then in an unlikely twist, Jehoshaphat sent out the choirs praising and giving thanks to God in front of the army. Instantly, God set ambushes against the enemy and they fell defeated. The same principle holds true in your life and mine. As you dare to praise God in advance of the miracle you need, He will defeat the enemy of fear in your life. Listen and obey whatever God shows you to do. God asked both Moses and King Jehoshaphat to do something that likely felt ridiculous! He asked Moses to simply stretch out his rod over the Red Sea, and He asked Jehoshaphat to send out the worship team in front of the army singing praises. Here’s the thing: when it comes to miracles, God will often ask us to do the ridiculous so that there can be no mistake—the miracle is only the work of His Almighty hand! Steve and I are in Phoenix this week, and then we’ll be in California meeting with friends of Reach Beyond. Steve and I continue to write the book Listen Well, Lead Better. Our manuscript is due at the end of January. Please pray for wisdom as we write. Please pray for more Plus Partners for Reach Beyond. A Plus Partner is a person who gives regularly to the ministry of Reach Beyond. It can be as little as a dollar a day towards the work of reaching unreached people groups. We know that God wants every people group represented before the throne. Join us in prayer as we seek to find the best way to reach these groups.